A license agreement is made between two parties, the licensor and the licensee. Typically, the licensor grants the licensee the right to use its property in exchange for royalty payments. License agreements are used in a variety of situations and deal with a variety of subject matter. Examples of these are: agreements to license intellectual property; agreements to develop, produce, and sell merchandise with a football team’s logo, and agreements to license the use of patented technology. 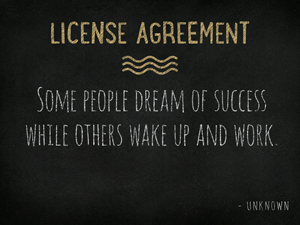 A license agreement is made between two parties, the licensor and the licensee. Typically, the licensor grants the licensee the right to use its property in exchange for royalty payments licensee. License agreements are complex business contracts and include terms that establish the scope of the agreement, including whether there are exclusivity or territorial restrictions; financial matters, for example, whether advances are required, and how royalties are to be calculated; guaranteed of minimum sales; the length of the agreement; returns and allowances; and time schedules. A license agreement also covers rights and obligations. For example, the lessor may have a right to monitor and control quality. These type of agreements describe in specificity how payments from the licensee to the licensor with occur. These payments are usually made in the form of guaranteed minimum payments and sales of royalties. Time frames and schedules are also an essential aspect of license agreements. For example, licensors may insist on a strict market release date for certain products that are licensed to outside parties. License agreements will account for the length of the contract, renewal options, and termination conditions.